When an alien-helmed tripod emerges from under suburban New Jersey and initiates a seemingly ceaseless run of carnage in War of the Worlds, Steven Spielberg makes a significant directorial decision: He shows us the opening salvo through the viewfinder of a death-ray-blasted man’s digital camera. It’s a clever trick — a meta-cinematic nod to the most iconic disaster imagery of our new century. We all know what imagery that is, of course, but the technological presentation and formatting of that imagery now interests Spielberg and his peers (and, usually, his imitators) more than the content of the imagery itself. The biggest issue: How to frame it? Even before 9/11, visual storytelling through the use of ever smaller, lighter and cheaper video cameras was already entering mainstream filmmaking. So if an out-of-nowhere groundbreaker like The Blair Witch Project pushed such storytelling over into viable generic territory, then it only makes sense that a big-budget, predetermined hit like Cloverfield would one day consummate that marriage: the blockbuster finally merged with YouTube. Cloverfield has more than that in common with the Witch. Its success and “movie of the moment” status has been all but assured by a viral marketing strategy that updates old-fashioned Barnum-esque foreplay for the era of the Web. It’s a tactic that perfectly complements Cloverfield's aesthetic draw, or gimmick, if you like: gargantuan Hollywood spectacle as seen through the “intimate” medium of handheld digital video. And it’s to their credit that television maestro J.J. Abrams and small-screen director Matt Reeves make good on the premise, pulling off Cloverfield’s conceit with audacious energy and inventiveness and preventing it from becoming purely think-piece fodder. The movie is presented as found footage recovered by the Department of Defense from the “incident site” named by the title, formerly known as Central Park. Starting as a mockument of a going-away party for young, corporate blandman Rob (Michael Stahl-David), Cloverfield quickly hits us with 9/11 iconography that’s fast (and disturbingly) being normalized by such movies: exploding buildings, streets of dust, panicked, screaming onlookers — all shot by Rob’s best friend and the movie’s comic relief, Hud (T.J. Miller), from angles and vantage points approximating the recorded chaos of That Day. This time it’s not the World Trade Center, but the Statue of Liberty that goes down: The Lady’s head falls into Manhattan and, in a terrific touch, is soon surrounded by a stunned crowd of people trying to capture the surreal scene with phone cameras and other portable devices. Once the enormous symbol of our terror-alert anxieties — a Rancor-like beast disseminating horrific spider monsters — meanders into the City, the action proceeds at a momentum-building, at times implausible pace aided immeasurably by the faux-guerilla format. There’s a show-off grandeur to it that at moments recalls The Lady in the Lake, the infamous 1947 experiment in exclusive first-person point of view, or Back to the Future: The Ride, the up-down-and-all-around simulation designed for extreme changes in perspective. But I hesitate to dismiss Cloverfield as a novelty. The seamlessness of its effects and the blatant echoes of its imagery — whether vulgar or not — redefine the parameters of realism in an otherwise by-the-numbers apocalyptic nightmare. If Cloverfield has raised the bar in that respect, there are still kinks to work out. The script by another TV veteran, Drew Goddard, is dull to the point of superfluity, daring the audience to spend an ounce of empathy caring about its vacuous characters, none of whom represent anything other than an idealized, attractive subset of the urban elite (although the manner in which “flashbacks” are employed is, admittedly, ingenious). This is where Cloverfield fails in comparison to other post-9/11 reimaginings like War of the Worlds and Children of Men: Its emotional palette is, simply put, impoverished and can’t account for either a humanistic or mythological response to catastrophe. But in a way it doesn’t need to. Cloverfield should be best appreciated for throwing down the gauntlet for a new cinematic representation of mass destruction and, thus, the way we see ourselves seeing our worst fears. 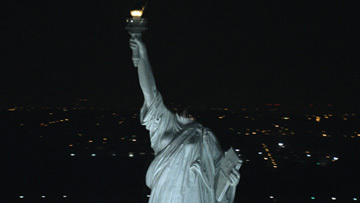 As its filmmakers keep discovering ways to compete with the omniscient camera of conventional blockbusters, Cloverfield becomes a terribly strange experience in spectatorship, continually slipping between personal and public subjectivity, with a point of view artificially privileged and yet inherently called into question. Broadcast yourself, indeed.